Background: Oxidative stress is associated with the progression of chronic kidney disease (CKD). Links between antioxidant enzyme SNPs such as superoxide dismutase (SOD) Ala16Val, glutathione peroxidase (GPx) Pro197Leu and catalase C-262T and CKD have not been investigated. This study compared antioxidant genotypes and activities of CKD patients with population controls, and determined their relationship to kidney function. 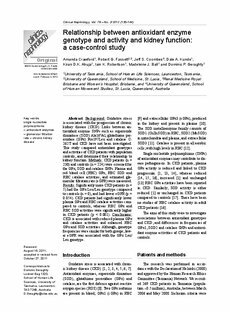 Methods: CKD patients (n=230) and controls (n=224) were screened for the GPx, SOD and catalase SNPs. Plasma and red blood cell (RBC) GPx, RBC SOD and RBC catalase activities, and estimated glomerular filtration rate (eGFR) were measured. Results: Significantly more CKD patients (n=5) had the GPx Leu/Leu genotype compared to controls (n=0), and had lower eGFR (p=0.054). CKD patients had significantly lower plasma GPx and RBC catalase activities compared to controls, whereas RBC GPx and RBC SOD activities were significantly higher in CKD patients (p<0.001). Conclusions: CKD is associated with reduced plasma GPx and catalase activities and enhanced RBC GPx and SOD activities. Although, genotype frequencies were similar for both groups, lower eGFR was associated with the GPx Leu/Leu genotype.